After making a decision to buy bitcoin, the question “where to buy?” becomes urgent. And if it was 2014 year, then there would be only six options. But the bitcoin hype of 2017 raised the number of such sites to more than two hundred. One of the main factors in choosing the place of purchase is what we will pay for BTC with: fiat or another cryptocurrency. If you plan to use altcoins, then it’s better to go to the exchange. Buying BTC for another cryptocurrency will be the cheapest option. You will have to pay a transaction fee and, possibly, withdrawal fee. For the deposit replenishment with altcoins, such resources usually do not take fees. Another advantage of exchanges is that the purchase rate on them is more profitable than on other sites. Most exchanges require registration and personal data verification. But some sites allow you to make transactions using only an email address. The need to understand the basics of trading – the issuance of orders for sale and purchase on existing orders – creates additional complexity. It holds the leading positions in the volume of deals with Bitcoin. 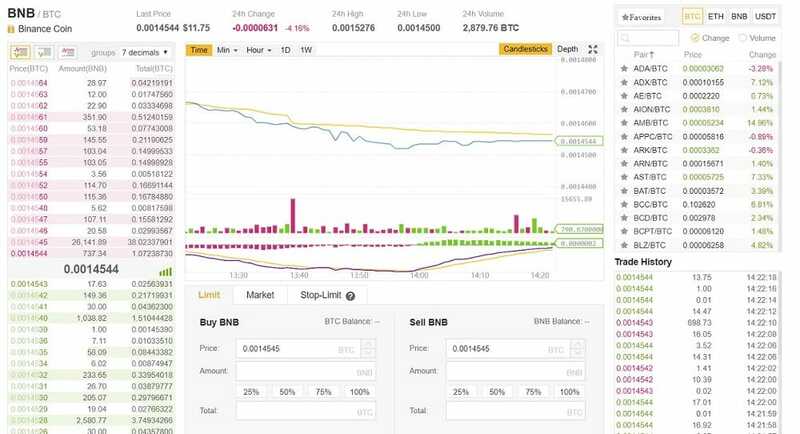 Binance.com exchange is one of the fastest growing exchanges. It is due to the rapid processing of transactions and low fees (0.1% of the transaction amount). Depositing cryptocurrency is free. For the bitcoins withdrawal a fee of 0.0005 BTC. You should mind that in order to perform transactions on the exchange, it is necessary to register and go through the verification process. The simplest first stage involves confirming the specified e-mail. This method allows you to withdraw no more than 2 BTC per day from the exchange. If you need to withdraw more you will need to confirm your phone number and to make selfie with your own identity documents. After a fairly long wait for the confirmation, it will be possible to withdraw up to 100 bitcoins per day. The next big exchange is Bittrex.com. Get to know how to buy Bitcoin on Bittrex in our guide. The transaction fee here is 0.25%. Operations on sale and purchase of cryptocurrency are fast. The withdrawal limit, as well as on the previous exchange, depends on the level of verification passed. If you’ve just registered, you will not be able to withdraw funds, but you can replenish the deposit without restrictions. The minimum withdrawal amount is 0,025 BTC – only if you passed the registration with e-mail confirmation. Another resource that deserves attention is the Poloniex.com exchange. The system has a simple and intuitive interface. And transaction fees are quite low – from 0.1% to 0.25%. Unlike the two exchanges described above, this site has an Exchange section, in which it is quite easy to instantly exchange bitcoins for altcoins. Like many cryptoexchanges, Poloniex has introduced strict rules of registration and verification since January 2018. Now, it’s not enough to confirm the email address to do pretty much anything on the platform. To successfully complete the KYC procedure, you must take a photo with an identity card and provide other requested data. If the exchange accepts fiat, it means that all users need to undergo a serious check. Most likely KYC standards will be used. It takes time and not everyone likes it. In addition to these difficulties, it is necessary to be able to make and take orders on exchanges. Fees at these sites are quite standard, about 0.2 – 0.3% of the transaction amount. But the fee for depositing fiat depends on which method is used for this. Coinbase.com already described in the debit card section is among such sites. Its partner platform GDAX.com is great for beginners who want to just some buy bitcoin for fiat. The resource takes moderate fees. Kraken.com also takes the moderate fee for buying Bitcoin using fiat. The only drawback of the site is the complicated interface. Bitfinex.com is another site where you can buy bitcoin for fiat. The resource is aimed at professional traders. And is characterized by a large trading volume. It is a peer-to-peer resource for buying bitcoins in many ways. Seller sets the rate. Registration is not required. The site guarantees the execution of the transaction through escrow accounts. Localbitcoins.com does not require users to submit personal data for verification. Also does not limit the amount of purchase. Perhaps bitcoins purchase rate is somewhat overstated. The rating system used for reviews and successful transactions allows you to choose a reliable partner. Paxful.com is the platform for direct connection of buyers and sellers with hundreds of payment methods supported. The site is functionally very similar to Localbitcoins. The difference is that by choosing a seller, you enter the chat with him. Here he gives you instructions on what to do. Most transactions are instant. But there are some variations that depend on the method of payment. The site also uses escrow accounts to ensure the transaction success. Sellers pay 1% fee, buyers don’t. This is the representative of a new generation of decentralized resources. Great functionality. It requires to install the platform wallet separately. On this site (bisq.network), blockchain guarantees security and reliability of the transaction. Here you can bargain about the price. Arbitrators monitores the transactions and get rewards for this work. All bitcoins involved in the transaction are placed in a special Multisig 2-out-of-3 purse. Fiat get from the buyer to the seller directly. The maximum transaction volume is 1 BTC. The fee is fixed – 0.001 BTC. In addition, a 3-fold Bitcoin network fee is collected (deposit from an external purse, sale and withdrawal to an external wallet). Coinbase.com limits purchases with a card by 150 dollars or euros per week. To perform operations, you need to create an account on the resource and link your card to it. The “Instant purchase” option greatly simplifies the process. Coinmama.com provides much larger limits on the purchase of bitcoin – up to $ 5,000 per day and up to $ 20,000 per month. Please note that residents of some US states can use the site. 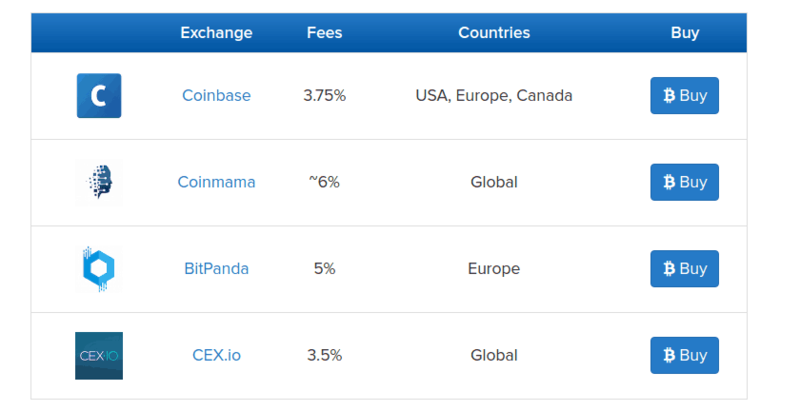 BitPanda.com includes its fee directly in the purchase price. Therefore, bitcoin price looks too high. But it shows immediately how much you will have to spend. Cex.io has is a very complicated process of user verification, which requires a lot of documents and time. Also, CEX may require users to provide a bank statement for the last 6 months or even a year. This is alarming because there is a high risk that your financial information may be disclosed to third parties. If you do not wish to provide your bank statement CEX may block your account. The best sites for buying bitcoins for the purpose of storage or payment are online exchangers. Including peer-to-peer services. If bitcoin is needed for trading, it will be optimal to buy it on the cryptoexchange where it is supposed to be traded.